In the village of Sloboda, in Vyatka Province, came the famous athlete Fedor Devils. He showed stunning tricks: tearing chains, juggling blindfolded trehpudovymi weights, ripping a deck of cards, bending fingers copper penny, his shoulders bent metal beams, smashing his fist rock ... In general, threw it into the indescribable joy of local residents. At the end of performances Possessed, as he always practiced, he turned to the audience: Can anyone wants to compete with me on the belts? Hall fell silent. Willing to go. Then the athlete called an assistant, and took him ten rubles, raised his hand up, and again turned to the audience with a smile: And this is the one who will hold against me ten minutes! Again, silence in the room. Suddenly, from somewhere in the gallery, whose bass that rumbled: Let's try. To the delight of the audience left the arena a bearded man in sandals and linen shirt. Growth it was yards - more than two feet, and shoulders into the door with difficulty prolezut. It was known throughout the province of strongman, a farmer from the village Saltyk Gregory Kosinski. About him were legendary. Grisha could, for example, linking twelve dvuhpudovyh weights, to load them on his shoulders and walk around with this enormous burden. It is said that once he put into the sleigh, in which rode the contractor, cheated workers sorokapudovuyu woman for driving piles. A struggle began. No knowledge of techniques, nor much experience could not save the Besov from defeat. The audience gasped in delight as bearded giant pripechataet to carpet a visiting athlete. Devils knew that he had met a nugget. After the speech, he took Grisha backstage and long to persuade to go with him - to show strength. Enthusiastically told me about your future career Devils Grisha about what awaits him fame. He finally agreed. A new life began, but certainly not so sweet, what drew him to the demons. Performances took place in the provinces, most often in the open air, with great physical exertion. There were some curious cases in these touring wanderings. That's what told Possessed of one of the cases, which happened to them. We came in with Grisha deaf - pregluhoy town. There's people like we have not seen ... Kascheev (alias Kosinski) - shaggy, like a beast, and my name Devils ... Appearance of a human we do not. We decided that we - the werewolves ... Not to mention a bad word to lasso us, taken out of town and say, If not get out of our city good, so blame yourself. So we Grisha - let God feet ... Speeches Kashcheeva enjoyed tremendous success, but more and more often, he said: No, go away from the circus. I get home, I will plow. Fight with Kashcheeva Zaikin in Paris in 1906 he met with world-class fighters. Befriended Ivan Zaikin who helped him to the big stage. Soon Kascheev puts on the shoulder of many famous athletes, and in 1908 with Ivan and Ivan Zaikin Poddubny going to the World Championships in Paris. With the victory of our heroes returned to their homeland. Kascheev won a prize. It would seem that now, and started this wrestling career Kashcheeva, but he still dropped everything and went to the village to plow the land. The best feature of Russian hero - a giant Gregory Kashcheeva are the words of the famous French organizers of the championship fight, the editor of the sports magazine "Hercules" Ivan Vladimirovich Lebedev: I've seen a lot of original people in my time director of the struggle, but still the most interesting by nature, I must assume Gregory Kashcheeva giant. In fact, it is difficult to imagine a man for 3 - 4 years old who made his European name, voluntarily retired from the arena back to his village again took up the plow and harrow. Immense force was the man. Nearly six feet in height (218sm) Kascheev, whether he is a foreigner, would have earned big money, because he exceeded the power of all the foreign giants. (Magazine "Hercules", № 2, 1915). Kascheev died in 1914. 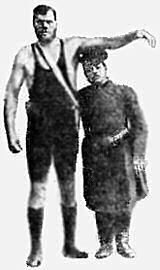 There were a lot of legends about his death, but what is reported in an obituary placed in the June issue of "Hercules" for 1914: May 25, the fifth ten years died of a heart-famous wrestler giant Kascheev Gregory, who dropped out of the circus arena and engaged in farming in his home village of Saltykov. Name Kashcheeva not so long ago thundered not only in Russia but also abroad. If in its place was another, more greedy for money and fame man, he could make a global career. But Grisha was a Russian peasant grower at heart, and it was irresistibly drawn to the most lucrative engagements - home to the ground. Great was the hero. But how many people now know about him?